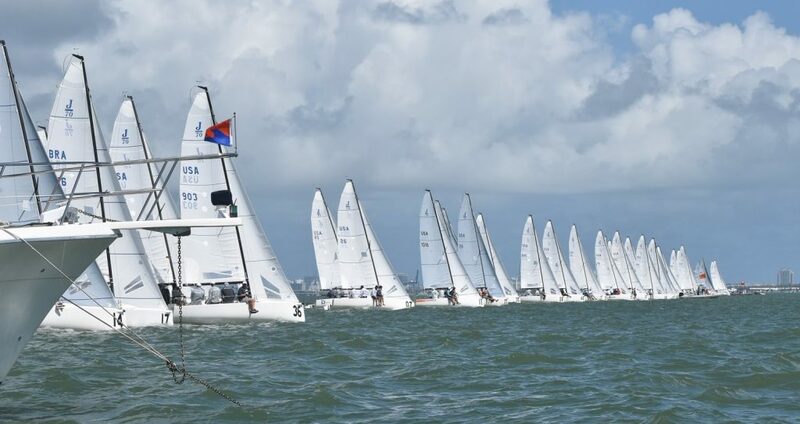 Every year J70’s from around the United States ascend on the “Sunshine State” of Florida for competitive J70 racing. This winter I was fortunate to attend several of the events and learned several lessons on how to be competitive in one of the deepest classes in the world. With over sixty boats on some of the starting lines, it was easy to get spit out the back of a start. Having a starting routine will ensure consistency in your starts, which will lead to better overall results. There are many things that go into a starting routine including wind shots, bearing on the line, what side you want to go to, but maybe one of the most important things is pinging the line. At the Miami, Mid-winters regatta there was a mid-line boat to help sailors find where the line was. It was conflicting because you had to start on one side or the other of that boat. In the J70 you use a Velocetik to help know your distance away from the line. You do this by pinging each end. But what happens when there is a mid-line boat? Well, part of your routine is determining where you want to go on the race course. On our boat, we felt as though the lowest density start was on either end of the mid-line boat. We also felt that starting and holding straight was the best option for our team. So what we did was we decided after the 10 minute (orange flag up) horn, on which side we would start on. From there we would either use the mid-line boat as a pin ping or a boat ping. To do that you need to hover around the midline boat for most of your routine and then go ping the mid-line boat first. With mid-line boats becoming more prevalent in J70 class racing keep this tip in mind the next time you come across the question: which side do we want to start on? One of the interesting parts of the J70 is each boat is slightly different from one another. The rigs especially all have different spreader sweeps, even from side to side! Before you go sailing lay your rig flat, with the spreaders on (see photo). Tie a piece of string from one spreader to the other. Then measure it against something that is perfectly flat. This will tell you if your spreaders are symmetric; and or how much spreader sweep you actually have. In our case, we had an asymmetric rig where our port spreader was swept slightly further back. This meant that we needed to be more creative with our rig set up. We first tried to set the rig up the same side to side. We really struggled on port getting back up to the similar speed on the starboard board. I tried everything, different main setups, different jib leads, etc. Then I tried to take one turn off the port lower and instantly took off. Our skipper even exclaimed, “wow that feels way better”. We also tried to set up our base settings to the tuning guide, and what we found was our rig liked the looser base setting and so we changed our base. My point being that use the tuning guide as a starting point, but don’t be afraid to play around with your settings during practice sessions before the event. One thing that I have been trying to be more cognizant of knowing exactly how fast is fast enough. It’s a funny statement but, you could be going 6.4 knots on the speedo, but against other boats, you are pointing 20 degrees lower. Then you could be going 5.4 knots and sailing higher than other boats, but then your competitors are going fast and at a better VMG. What we did on our boat is during our pre-start line up with other boats, as the main trimmer, I would call out our speed and someone on the rail would call out our relative speed and height against other boats that were around us. From there we would determine what our target speed was in the puffs and lulls. We would then record them at the end of days and try and use it as a base for another day that had similar conditions. This would give the driver something to aim for, he would also start to develop feel, and would be able to make adjustments without anyone telling him a relative speed. 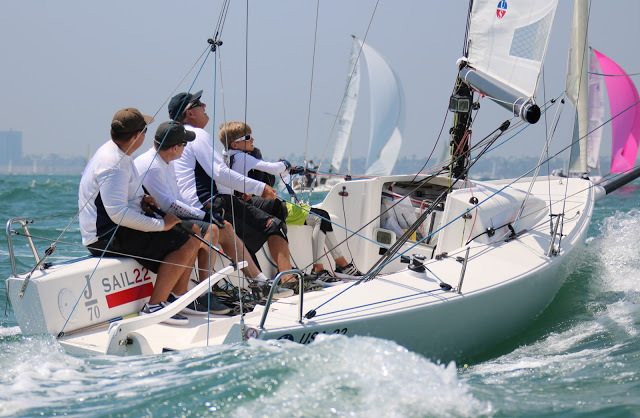 The next time you go to a big J70 regatta try these three tips to improve your performance. Knowing you set up with allow you to mess with target speeds. Knowing where you want to start relative to the mid-line boat will help you decide your pings. Do all of these things well, and you and your team will find yourselves in the mix more often than not. If anyone has any questions feel free to call the loft and ask for Alex. Thank you to the J70 Class for great picture of the start.